A team of professional and citizen scientists from the international Radio Galaxy Zoo project has doubled the known number of a rare type of galaxy. This work, led by CAASTRO’s Dr Anna Kapínska (International Centre for Radio Astronomy Research, University of Western Australia) is published today in The Astronomical Journal; Ivan Terentev, a citizen scientist, is the second author. Kapínska’s team has been looking for rare galaxies called Hybrid Morphology Radio Sources or HyMoRS. These combine the characteristics of two classes of galaxy that were first thought to be distinct. HyMoRS are the astronomical equivalent of a centaur, the mythical man-horse hybrid. Finding more HyMoRS helps us understand what kind of galaxy can turn out this way, and what gives them their unusual properties. Knowing that, in turn, helps us better understand how all galaxies evolve. Large galaxies have massive black holes at their centres. While consuming matter, these black holes often produce large jets of radio-emitting material that blast millions of light years out into space. Galaxies with jets are often divided into two classes, Fanaroff-Riley I and Fanaroff-Riley II (or FR I and II). FR I galaxies have jets that fade away as they extend outwards, while FR II galaxies have jets that end in a bright, strongly-emitting region (a ‘hotspot’). The two galaxy classes were first described by astronomers Bernie Fanaroff and Julie Riley in 1974. For the next quarter-century astronomers thought they were quite distinct. Then, in 2002, a rare hybrid form – the HyMoRS – was discovered. But fewer than 30 HyMoRS had been found, until the Radio Galaxy Zoo team identified 25 more. L-R: An FR I galaxy (radio jets in blue, overlaid on an infrared image); a HyMoRS galaxy; and an FR II galaxy. The HyMoRS galaxy shows both FR I and FR II characteristics. Image: A. Kapínska et al. Finding more HyMoRS is giving us clues as to how they form. Some may simply be an illusion. The jets may be physically the same on both sides, but because one is pointed towards us and the other away from us, they look different. But we may also be seeing the central black hole ‘switching off’ (ceasing to actively swallow material), or switching off and then on again. This seems to have happened in one of the new HyMoRS from Radio Galaxy Zoo. Yet other HyMoRS may be caused by environmental effects, such as the jets travelling out into regions of space that contain different densities of material. Modelling shows that the environment can affect the jets’ size and brightness. Radio Galaxy Zoo demonstrates how effective citizen science can be at discovering rare objects. The project is led by two CAASTRO scientists, Dr Julie Banfield (Australian National University) and Dr Ivy Wong (International Centre for Radio Astronomy Research, University of Western Australia). Astronomy is entering a golden age, in which we seek to understand the complete evolution of the Universe and its constituents. But the key unsolved questions in astronomy demand entirely new approaches that require enormous data sets covering the entire sky. In the last few years, Australia has invested more than $400 million both in innovative wide-field telescopes and in the powerful computers needed to process the resulting torrents of data. Using these new tools, Australia now has the chance to establish itself at the vanguard of the upcoming information revolution centred on all-sky astrophysics. NGC253 starburst galaxy in optical (green; SINGG Survey) and radio (red; GLEAM) wavelengths. The H-alpha line emission, which indicates regions of active star formation, is highlighted in blue (SINGG Survey; Meurer+2006). Credits: A.D. Kapinska, G. Meurer. ICRAR/UWA/CAASTRO. A starburst galaxy is a galaxy experiencing a period of intense star formation and this one, known as NGC 253 or the Sculptor Galaxy, is approximately 11.5 million light-years from Earth. “The Sculptor Galaxy is currently forming stars at a rate of five solar masses each year, which is a many times faster than our own Milky Way,” said lead researcher Dr Anna Kapinska, from The University of Western Australia and the International Centre for Radio Astronomy Research (ICRAR) in Perth. The Sculptor Galaxy has an enormous halo of gas, dust and stars, which had not been observed before at frequencies below 300 MHz. The halo originates from galactic “fountains” caused by star formation in the disk and a super-wind coming from the galaxy’s core. The study used data from the ‘GaLactic and Extragalactic All-sky MWA’, or ‘GLEAM’ survey, which was observed by the Murchison Widefield Array (MWA) radio telescope located in remote Western Australia. “With the GLEAM survey we were able, for the first time, to see this galaxy in its full glory with unprecedented sensitivity at low radio frequencies,” said Dr Kapinska. 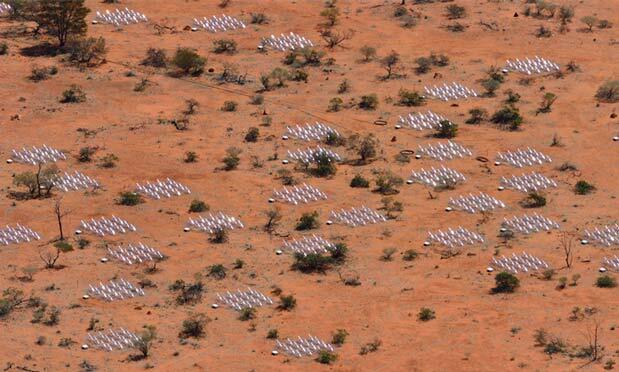 The MWA is a precursor to the Square Kilometre Array (SKA) radio telescope, part of which will be built in Western Australia in the next decade. Co-author Professor Lister Staveley-Smith, from ICRAR and the ARC Centre of Excellence for All-sky Astrophysics (CAASTRO), said the SKA will be the largest radio telescope in the world and will be capable of discovering many new star-forming galaxies when it comes online. “But before we’re ready to conduct a large-scale survey of star-forming and starburst galaxies with the SKA we need to know as much as possible about these galaxies and what triggers their extreme rate of star formation,” he said. Spectral Energy Distribution and Radio Halo of NGC 253 at Low Radio Frequencies, published in the Astrophysical Journal on March 28th, 2017. ICRAR is an equal joint venture between Curtin University and The University of Western Australia with funding support from the State Government of Western Australia. The Centre’s headquarters are located at UWA, with research nodes at both UWA and the Curtin Institute for Radio Astronomy (CIRA). ICRAR has strong support from the government of Australia and is working closely with industry and the astronomy community, including CSIRO and the Australian Telescope National Facility, iVEC, and the international SKA Project Office (SPO), based in the UK. Playing a key role in the international Square Kilometre Array (SKA) project, the world’s biggest ground-based telescope array. Attracting some of the world’s leading researchers in radio astronomy, who will also contribute to national and international scientific and technical programs for SKA and ASKAP. Creating a collaborative environment for scientists and engineers to engage and work with industry to produce studies, prototypes and systems linked to the overall scientific success of the SKA, MWA and ASKAP. Enhancing Australia’s position in the international SKA program by contributing to the development process for the SKA in scientific, technological and operational areas. Promoting scientific, technical, commercial and educational opportunities through public outreach, educational material, training students and collaborative developments with national and international educational organisations. Establishing and maintaining a pool of emerging and top-level scientists and technologists in the disciplines related to radio astronomy through appointments and training. Making world-class contributions to SKA science, with emphasis on the signature science themes associated with surveys for neutral hydrogen and variable (transient) radio sources. Making world-class contributions to SKA capability with respect to developments in the areas of Data Intensive Science and support for the Murchison Radio-astronomy Observatory. Angular momentum is a fundamental property of galaxies, together with mass and energy. It is crucial to many scaling relations, for example the relation between a galaxy’s luminosity and its rotational velocity and size. Galaxy formation theory postulates that the amount of angular momentum in spiral galaxies can be obtained by assuming that they formed in dark matter halos through conservation of angular momentum. Elliptical galaxies though, which have much lower spins, need to lose more than 90% of the angular momentum they were formed with. Galaxy mergers are the main scenario invoked to explain such a major loss. In a new publication, CAASTRO member Dr Claudia Lagos (ICRAR-UWA) and colleagues analysed the evolution of the angular momentum of galaxies in the EAGLE hydrodynamical simulations. EAGLE is a state-of-the-art simulation that has a unique compromise between the resolution required to study the structural properties of galaxies (spatial resolution of 700 pc) and the simulated cosmological volume (100 Mpc box side length). This allows for the study of about 13,000 galaxies in the simulation-equivalent of the local Universe. EAGLE is unique in its accurate reconstruction of galaxy properties across multiple research studies, predicting galaxies of roughly the right sizes, morphologies, colours, gas contents and star formation throughout cosmic time. This new study has found a correlation between the galaxies’ specific angular momentum (i.e. angular momentum as function of mass) and their stellar mass – in excellent agreement with observations and with the positions of galaxies as they correlate with gas content. Analysing galaxy evolution in EAGLE paints a picture that is more complex than what theory predicted: galaxies that have high specific angular momentum now formed most of their stars during the second half of the age of the Universe, from gas that was falling into their halos with high specific angular momentum. In contrast, galaxies that have low specific angular momentum now formed most of their stars during the first half of the age of the Universe, from material that had much lower specific angular momentum compared to the infalling gas later. The researchers conclude that the simple picture of two alternative scenarios – conservation of specific angular momentum or mergers that spin-down galaxies – does not capture what EAGLE has revealed to happen. How quickly a galaxy spins appears to depend on the individual star formation history with a contribution from the merger history. In research published today [MNRAS], Australian scientists have taken a critical step towards understanding why different types of galaxies exist throughout the Universe. The research, made possible by cutting-edge instrumentation, means that astronomers can now classify galaxies according to their physical properties rather than human interpretation of a galaxy’s appearance. For the past 100 years, telescopes have been capable of observing galaxies beyond our own galaxy, the Milky Way. Only a few were visible to begin with but as telescopes became more powerful, more galaxies were discovered, making it crucial for astronomers to come up with a way to consistently group different types of galaxies together. In 1926, the famous American astronomer Edwin Hubble refined a system that classified galaxies into categories of spiral, elliptical, lenticular or irregular shape. This system, known as the Hubble sequence, is the most common way of classifying galaxies to this day. Despite its success, the criteria on which the Hubble scheme is based are subjective, and only indirectly related to the physical properties of galaxies. This has significantly hampered attempts to identify the evolutionary pathways followed by different types of galaxies as they slowly change over billions of years. Dr Luca Cortese, from The University of Western Australia node of the International Centre for Radio Astronomy Research (ICRAR), said the world’s premier astronomical facilities are now producing surveys consisting of hundreds of thousands of galaxies rather than the dozens that Hubble and his contemporaries were working with. “We really need a way to classify galaxies consistently using instruments that measure physical properties rather than a time consuming and subjective technique involving human interpretation,” he said. In a study led by Dr Cortese, a team of astronomers has used a technique known as Integral Field Spectroscopy to quantify how gas and stars move within galaxies and reinterpret the Hubble sequence as a physically based two-dimensional classification system. “Thanks to the development of new technologies, we can map in great detail the distribution and velocity of different components of galaxies. Then, using this information we’re able to determine the overall angular momentum of a galaxy, which is the key physical quantity affecting how the galaxy will evolve over billions of years. The new study involved 488 galaxies observed by the 3.9m Anglo Australian Telescope in New South Wales and an instrument attached to the telescope called the Sydney-AAO Multi-object Integral-field spectrograph or ‘SAMI’. The SAMI project, led by the University of Sydney and CAASTRO, aims to create one of the first large-scale resolved survey of galaxies, measuring the velocity and distribution of gas and stars of different ages in thousands of systems. “Australia has a lot of expertise with this type of astronomy and is really at the forefront of what’s being done,” said Professor Warrick Couch, Director of the Australian Astronomical Observatory and CAASTRO Partner Investigator. “For the SAMI instrument we succeeded in putting 61 optical fibres within a distance that’s less than half the width of a human hair. Future upgrades of the instrument are planned that will allow astronomers to obtain even sharper maps of galaxies and further their understanding of the physical processes shaping the Hubble sequence. “As we get better at doing this and the instruments we’re using are upgraded, we should be able to look for the physical triggers that cause one type of galaxy to evolve into another — that’s really exciting stuff,” Dr Cortese said. Star formation in galaxies is a local process whereby stars form out of molecular Hydrogen (H2). Detailed multiwavelength studies of the gas and stellar components of nearby galaxies have found the H2 star formation efficiency (SFEh2) – the ratio of star formation rate to the H2 mass – to be approximately constant. Similarly, the atomic Hydrogen (HI) star formation efficiency (SFEhi) has also been observed to be uniform across 5 orders of magnitude in galaxy stellar masses. Since the fraction of HI and H2 is known to vary within a galaxy, as well as between galaxies, it is unclear what is driving the observed uniformity in SFEhi. A new model, by CAASTRO Affiliate Dr Ivy Wong (ICRAR-UWA) and colleagues, is the first to link the uniform SFEhi observed in low-redshift galaxies to star-forming disks with constant marginal stability. In their simple model, disk stability is derived from a two-fluid approach: one fluid representing the gas component and the other the stellar component. The researchers tested two versions of their model with differing prescriptions for determining the molecular gas fraction, based on either the hydrostatic pressure or the stellar surface density of the modelled disk. For high-mass galaxies such as the Milky Way, they found that both prescriptions were able to reproduce the observed SFEhi. However, the hydrostatic prescription was the only prescription that was able to reproduce the observed SFEhi for both low- and high-mass galaxies. The primary driver of the disk structure in the model is the amplitude of the rotational velocity, Vmax, while the specific angular momentum of the galaxy may play a role in explaining the weak correlation between SFEhi and the effective surface brightness of the disk. The team was also able to reproduce the observed star formation properties of a proto-Milky Way at higher redshifts when the Universe was at its peak star formation period. The success of their model at reproducing the observed star formation properties in galaxies at low and high redshifts suggests that star formation in galaxies is largely governed by the formation and stabilisation of their disks. CAASTRO has assembled the world-class team who will now lead the flagship scientific experiments on these new wide-field facilities. We will deliver transformational new science by bringing together unique expertise in radio astronomy, optical astronomy, theoretical astrophysics and computation and by coupling all these capabilities to the powerful technology in which Australia has recently invested. Between 100 million to one billion years after the Big Bang, the Universe went through a transition, where neutral hydrogen was ionised, transforming the intergalactic medium from opaque to transparent. This “Epoch of Reionisation” is receiving intense research focus, as there are still many open questions about this period. While future telescopes like the Square Kilometre Array (SKA) will be able to look at the neutral hydrogen, observing the stars and galaxies that were the sources of reionisation is still difficult. One possibility of investigating the formation and evolution of galaxies in the early Universe, along with the progression of reionisation, is to observe the ultraviolet light emitted by these high-redshift sources (stretched to be detected at infrared wavelengths from Earth) with space telescopes, located above the Earth’s atmosphere. Deep legacy surveys with the Hubble Space Telescope (HST) have produced a growing sample of galaxies during this period. At the highest redshifts, the number of galaxy candidates is still small, with only a handful detected in HST imaging. To increase the sample, CAASTRO PhD student Stephanie Bernard (University of Melbourne), along with international collaborators, used HST/Wide Field Camera 3 (WFC3) imaging from the Brightest of Reionising Galaxies (BoRG) survey to search for the brightest galaxies only 500 million years after the Big Bang. The team found six interesting candidates in archival data. They conclude that half of the sample are strong candidates to be some of the highest-redshift galaxies so far discovered, while the other half likely to be lower-redshift sources. The researchers also calculated the “number density”, that is, the number of high-redshift galaxies in a given volume. They then determined the “luminosity function” or the number of galaxies at a particular brightness. Interestingly, when compared to previous calculations from surveys like the Cosmic Assembly Near-infrared Deep Intergalactic Legacy Survey (CANDELS), which also used WFC3 imaging, Bernard and her collaborators found almost ten times as many bright galaxies than expected. They also noted that three candidates in their sample are located in the same WFC3 pointing, which is an indication of significant clustering, as expected for very bright galaxies at high redshift. Ongoing follow-up observations by the team will shed more light on the nature of these candidate galaxies. Intensity mapping is a novel technique that uses the Hydrogen emission at radio wavelengths of galaxies as a proxy for galaxy distribution on large scales. The statistical properties of this distribution help us understand the cosmological principles of our Universe. Hydrogen gas is the most abundant element in the Universe, and it is the main ingredient to fuel star-formation processes in galaxies and is thus driving galaxy evolution. The individual detection of cold Hydrogen gas in distant galaxies is not yet feasible with radio telescopes. However, using intensity mapping, we observe the combined – or binned – emission of many galaxies through low-resolution maps and are able to observe the Cosmic Web over very large distance ranges. The galaxy distribution is quantified by measuring the cosmological power spectrum. These power spectra contain information on the clustering strength of galaxies as a function of distance or scale. In recent analysis, the intensity mapping data was jointly analysed with optical data of the same regions to measure the cross-power spectrum, to eliminate foregrounds and instrumental noise contaminations in the maps. As part of the CAASTRO intensity mapping project, CAASTRO post-doctoral fellow Dr Laura Wolz and colleagues at the University of Melbourne have theoretically investigated the signature of the cross-power spectrum of intensity maps with optical galaxy data. They modelled the intensity mapping signal using numerical simulations of the evolution of galaxies with cosmic time. In addition, they synthesised a mock galaxy catalogue of optical telescope observations based on the same simulation. In their study, the researchers show that the cross-power spectrum of intensity maps and optical galaxies has a different shape depending on how the optical galaxies were selected: blue galaxies, which are highly star-forming, show a much higher clustering signal on small scales than red galaxies, which are relatively passive. This proves that these signals can be linked back to the Hydrogen content of the optical galaxies as it correlates with the galaxy colour: blue galaxies are rich in cold gas while red galaxies are relatively gas poor. Intensity mapping in combination with optical galaxy measurements may therefore indirectly detect the Hydrogen gas content of the optical galaxies that were selected according to their colours. This theoretical study is the first proof of concept of this new Hydrogen detection technique, and the approach opens up new possibilities in understanding the gas content, and thus the star-formation activity, of very distant galaxies which are inaccessible to direct observations with our current generation of radio telescopes. High time resolution radio surveys over the last decade have discovered a population of millisecond-duration transient bursts called Fast Radio Bursts (FRBs) of unknown. Only 18 of these bursts have been detected to date, and their origin – whether extragalactic or at even cosmological distances – is still uncertain. CAASTRO PhD student Manisha Caleb (ANU and Swinburne University of Technology) and colleagues have now scrutinised the FRB properties: energy distribution, spatial density as a function of redshift and properties of the Interstellar and Intergalactic Media. The researchers ran simulations to test whether a cosmological population is a feasible scenario and to compare their simulations to data from the High Time Resolution Universe survey that used the Effelsberg radio telescope in Germany and the 64-m Parkes radio telescope in Australia. Their Monte Carlo simulations were based on two scenarios for the co-moving numbers of FRBs: a constant co-moving density model and a model in which the number of FRBs is proportional to the known cosmic star formation history (SFH). The most interesting property of the simulated events is their distribution of detections above some fluence (so-called logN-logF curves): if the sources have an even approximately typical luminosity (i.e. are standard candle-like), then the slope of this relation is a probe of their spatial distribution. For standard candles in the standard model of cosmology – LCDM – the slope varies smoothly from -3/2 for the nearby universe, gradually becoming flatter as further distances are probed. To illustrate, at a redshift of z ~0.7, which is typical of FRBs found to date, standard candles yield a relation with a slope of ~ -1. The observed slope of the logN-logF of the 9 FRBs analysed in this study is -0.9 +/- 0.3. The team’s simulations were able, in both scenarios for the number density of the sources with redshift, to match this slope well, yielding -0.8 +/- 0.3 for the cosmic SFH and -0.7 +/- 0.2 for the constant density case. They concluded that the properties of the observed FRBs are generally consistent with arising from sources at cosmological distances. The researchers also simulated FRB rates at the upgraded Molonglo telescope, UTMOST, and at Parkes for the Multibeam and the planned Phased Array Feed (PAF) receivers. They applied conservative assumptions about the spectral index of FRBs and the sensitivity of the instruments. According to those simulations, UTMOST has the capability, at full design sensitivity, to dominate the FRB detection rate. Uncertainty in the final PAF design sensitivity make predictions difficult for Parkes but its wide sky coverage has the potential to increase the FRB discovery rate close to the fluence limit. The fully sensitive UTMOST will dominate the event detection rate at all fluences. We are not living in a fixed rest frame on Earth: the Earth is orbiting around the Sun, the Sun is moving around the centre of our galaxy, and the galaxy itself is moving towards the nearest mass over-density around us, which is the nearest galaxy cluster in Virgo. Similar motions arise from even larger scales and larger mass densities, such as the gravitational anomaly “Great Attractor”. To get a complete overview of these motions, we need a whole-sky map of the galaxies, together with these gravitationally induced motions. A major stumbling block in these efforts is our own galaxy, which blocks the sky behind it from our view. Many of the large-scale structures are hidden behind the dust and stellar density of our Milky Way, notably the Great Attractor, Perseus-Pisces Supercluster, Puppis Cluster and the Local Void. This results in the so-called “Zone of Avoidance” (ZoA). Contrarily to optical light though, radio waves travel unhindered through the galaxy. Researchers are therefore using the Parkes radio telescope to measure the gas in galaxies hidden behind the Milky Way. Combining these observations with near infrared (NIR) imaging allows measuring the distance and gravitationally induced peculiar velocity via a distance indicator called the Tully-Fisher (TF) relation. CAASTRO PhD student Khaled Said, who is jointly supervised by researchers at the Astrophysics, Cosmology and Gravity Centre at the University of Cape Town, South Africa, and CAASTRO Deputy Director Prof Lister Staveley-Smith (ICRAR-UWA), recently published his analysis of 290 new galaxy observations with the Parkes Multibeam Receiver. The team also used 104 additional galaxies from the existing HIZoA survey. The final sample contained 342 inclined spiral galaxies in the southern ZoA with adequate signal-to-noise and HI profiles suitable for their TF analysis. The aim of this analysis was the development of a systematic processing pipeline for HI line spectra for future applications of the TF relation in the ZoA. Their current sample, in conjunction with their previously published newly calibrated TF relation and current NIR data, will be the first accurate determination of flow fields in the southern ZoA. Their results will be an important contribution to the forthcoming WALLABY survey (Widefield ASKAP L-band Legacy All-sky Blind surveY) and its northern hemisphere counterpart, the Westerbork Northern Sky HI Survey (WNSHS). The group of lowest mass stars and brown dwarfs are collectively called ultracool dwarfs. A number of these objects are sources of both burst and quiescent radio emission. The radio bursts are sometimes found to occur periodically on the timescale of the rotation of the ultracool dwarf or as isolated events. They are highly circularly polarised and occur over a timescale of a few minutes. Alternatively, the quiescent emission is observed to have very little variability and low circular polarisation. Both radio emission components are thought to be the result of magnetic processes and imply that ultracool dwarfs are able to generate and sustain strong magnetic fields. This is unexpected though, given their non-solar-like interior and the observed decline in the strength of magnetic activity tracers at other wavelengths. Radio surveys of ultracool dwarfs have found that about 10% of these systems are radio luminous, with 21 currently known to have radio emission. Correlations between the presence of radio emission and other dwarf properties such as rotation are not well established. Furthermore, little is known about the magnetic environment responsible for the radio emission observed in ultracool dwarfs. To address these issues, CAASTRO members Dr Christene Lynch and Dr Tara Murphy (University of Sydney), together with colleagues from Australia and overseas, carried out a survey of 15 ultracool dwarfs located in the Southern hemisphere using the Australia Telescope Compact Array [ATCA]. ATCA is able to simultaneously observe over a wide range of frequencies, providing detailed information on the time-frequency structure of radio bursts and quiescent emission. Such a characterisation is required if we want to constrain the magnetic properties of ultracool dwarfs. The researchers detected radio emission from three of the 15 observed sources, including the detection of a new source, 2MASSW J0004348–404405. The emission from these three sources showed no variability or burst emission and was consistent with emission from a gyrosynchrotron mechanism. To characterise the magnetic conditions responsible for the observed radio emission, the team constructed a simple stellar magnetospheric model consisting of mildly-relativistic electrons that spiralled in a uniform magnetic field. They found the observed quiescent emission to be consistent with radio emission expected from a magnetic environment with a field strength 10 – 230 G and electron density 104 – 108 cm-3. Additionally, they analysed the general trends of the radio emission for this sample of 15 sources and found that the radio activity increased for later spectral types and more rapidly rotating objects.